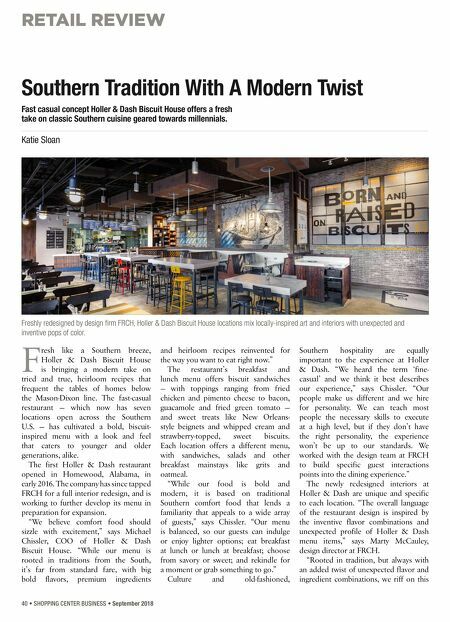 RETAIL REVIEW 40 • SHOPPING CENTER BUSINESS • September 2018 F resh like a Southern breeze, Holler & Dash Biscuit House is bringing a modern take on tried and true, heirloom recipes that frequent the tables of homes below the Mason-Dixon line. The fast-casual restaurant — which now has seven locations open across the Southern U.S. — has cultivated a bold, biscuit- inspired menu with a look and feel that caters to younger and older generations, alike. The first Holler & Dash restaurant opened in Homewood, Alabama, in early 2016. The company has since tapped FRCH for a full interior redesign, and is working to further develop its menu in preparation for expansion. 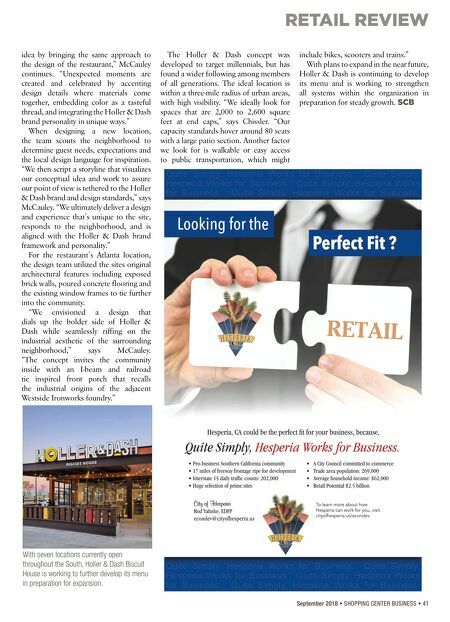 "We believe comfort food should sizzle with excitement," says Michael Chissler, COO of Holler & Dash Biscuit House. "While our menu is rooted in traditions from the South, it's far from standard fare, with big bold flavors, premium ingredients and heirloom recipes reinvented for the way you want to eat right now." The restaurant's breakfast and lunch menu offers biscuit sandwiches — with toppings ranging from fried chicken and pimento cheese to bacon, guacamole and fried green tomato — and sweet treats like New Orleans- style beignets and whipped cream and strawberry-topped, sweet biscuits. Each location offers a different menu, with sandwiches, salads and other breakfast mainstays like grits and oatmeal. "While our food is bold and modern, it is based on traditional Southern comfort food that lends a familiarity that appeals to a wide array of guests," says Chissler. "Our menu is balanced, so our guests can indulge or enjoy lighter options; eat breakfast at lunch or lunch at breakfast; choose from savory or sweet; and rekindle for a moment or grab something to go." Culture and old-fashioned, Southern hospitality are equally important to the experience at Holler & Dash. "We heard the term 'fine- casual' and we think it best describes our experience," says Chissler. "Our people make us different and we hire for personality. We can teach most people the necessary skills to execute at a high level, but if they don't have the right personality, the experience won't be up to our standards. We worked with the design team at FRCH to build specific guest interactions points into the dining experience." The newly redesigned interiors at Holler & Dash are unique and specific to each location. "The overall language of the restaurant design is inspired by the inventive flavor combinations and unexpected profile of Holler & Dash menu items," says Marty McCauley, design director at FRCH. " Rooted in tradition, but always with an added twist of unexpected flavor and ingredient combinations, we riff on this Southern Tradition With A Modern Twist Fast casual concept Holler & Dash Biscuit House offers a fresh take on classic Southern cuisine geared towards millennials. Katie Sloan Freshly redesigned by design firm FRCH, Holler & Dash Biscuit House locations mix locally-inspired art and interiors with unexpected and inventive pops of color.